The delegates and ministers have walked in, the press scrum (or should you choose the term g*ng b*ng) is over and the closed door meeting has begun – all ahead of a decision on production quotas and the possible appointment of a new secretary general. Smart money is on OPEC maintaining output at its current level of 30 million barrels per day (bpd), with the Saudis curbing their breaches of set quotas and the cartel reporting a real terms cut in November. No one smart would put money on who the new OPEC Secretary General might be. But before that, there are as usual some leaks here and some soundbites there to contend with. These generally nudge analysts and journalists alike in the general direction of what the decision might be. Arriving in Vienna ahead of the meeting, Saudi Arabia’s oil minister Ali al-Naimi, the key man at the table, shunned the international media to begin with and chose to issue a statement via his country’s national press agency. In his statement, Naimi said the main aim of the December 12 meeting is to keep the balance of the global crude markets in order to serve the interests of producers and consumers. He added that balancing the market will help the growth of the global economy. Since then, he has maintained the same line in exchanges with journalists. As expected, the Iranians feel a cut in production was needed, saying their fellow members are producing 1 million bpd more than they ought to be. Iran said OPEC’s statement last month, that economic weakness in some major consuming countries could shave off 20% from its global demand growth outlook for 2013, lends credence to their claim. However, a delegate admitted there was "little need to change anything" and that the current US$100-plus OPEC basket price was "ok."
Meanwhile, two key men are not in Vienna – namely Kuwait’s oil minister Hani Abdulaziz Hussein and Venezuela’s Rafael Ramirez. According to a Venezuelan scribe, the latter has sent Bernard Mommer, the OPEC representative for Venezuela’s oil ministry, in his place so he could support President Hugo Chavez, who is undergoing cancer surgery in Cuba. Ramirez added that Venezuela did not believe it was necessary for OPEC to increase production quotas and that the market was “sufficiently” supplied. Finally, in his opening address, Iraqi oil minister and president of the conference Abdul-Kareem Luaibi Bahedh said OPEC faces a period of continuing uncertainty about the oil market outlook. "To a great extent, this reflects the lack of a clear vision on the economic front. The global economy has experienced a persistent deceleration since the beginning of the year...In the light of this, world oil demand growth forecasts for this year have been revised down frequently," he added. Turning to the oil price, he said it had strengthened in the six months since June. "For its part, OPEC continues to do what it can to achieve and maintain a stable oil market...However, this is not the responsibility of OPEC alone. If we all wish to benefit from a more orderly oil market, then we should all be prepared to contribute to it. This includes consumers, non-OPEC producers, oil companies and investors, in the true spirit of dialogue and cooperation," said the Iraqi oil minister. Meanwhile, as a footnote, the IEA raised its projections for non-OPEC supply in 2013 in its Monthly Oil Market Report published on December 12. The agency said global oil production increased by 730,000 bpd to 91.6 million bpd in November. With non-OPEC production rebounding "strongly" in November to 54.0 million bpd, the IEA revised up its forecasts for non-OPEC fourth quarter supply by 30,000 bpd to 53.8 million bpd. For next year, IEA expects non-OPEC production to rise to 54.2 million bpd; the fastest pace since 2010. It also added that OPEC supply rose by "a marginal" 75,000 bpd to "31.22 million bpd". IEA said the OPEC crude supply increases were led by Saudi Arabia, Angola, Algeria and Libya but offset by recent production problems in Nigeria. Keep reading, keep it 'crude'! © Gaurav Sharma 2012. 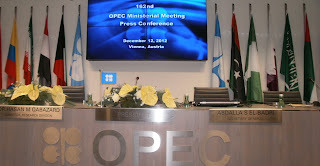 Photo: OPEC briefing room at 162nd meeting of OPEC, Vienna, Austria © Gaurav Sharma, December 2012. Splendid dossier on a secretive "supermajor"
Why Iran is miffed at (some in) OPEC? A meeting, an appointment & Vienna’s icy chill! I am a London based financial writer and oil & gas sector analyst. I commenced my career in 1997 with internships at several newspapers and CNBC Asia. I have since worked for Informa, CNBC Europe, Canadian Economic Press, UNI, Infrastructure Journal and IDG among others. At present, I am a columnist for Forbes. Apart from UK-based work, I have also reported from Canada, China, EU, India, Hong Kong, Japan, Middle East, Russia, Switzerland and USA. I have written about the oil & gas sector since 2004 including spot reports, coverage of OPEC summits, analysis of oil corporations’ financials and exploration data. Content: The author of this blog/website - Gaurav Sharma - retains copyright of any articles and blog posts published here. Unless the author’s written consent is obtained in advance, you may not reproduce, sell, publish, distribute, retransmit, disseminate, perform, display, broadcast, create new works from, or commercially exploit the content available here which is protected under UK copyright law. Photographs & graphics: Copyright and courtesy of third party images and graphs on this blog/website is duly acknowledged and clearly mentioned as, when and where applicable. Additionally, the author of this blog/website - Gaurav Sharma - retains copyright of any images photographed by him or charts and graphs drawn by him as stated where applicable. Unless the author’s written consent is obtained in advance, you may not reproduce, sell, publish, distribute, retransmit, disseminate, perform, display, broadcast, create new works from, or commercially exploit the graphics, photography and broadcast material available here which is protected under UK copyright law. Content on this blog/website is for informational purposes only. Commentaries, analysis and articles published are based upon information gathered from various sources believed to be reliable, complete and accurate. However, no guarantee can be made about the validity of the believed sources. All statements, commentaries and expressions on this blog/website including that of the author are opinions and not meant implicitly or explicitly as recommendations, investment advice or solicitation to trade oil and gas products, place spot or futures trades, CFDs or spreadbets. Oil and gas markets can be volatile and opinions may change without notice. This website is an opinion forum and should be interpreted as such. Its content is neither explicitly nor implicitly aimed at endorsing any trading platform(s), pattern(s) or product(s). Links from this website, if any, are being provided for convenience, informational and reference purposes only. They do not constitute an implicit or explicit endorsement by the author of this blog/website in relation to any of information contained in these links or any products, services or opinions offered on such links. The author of this blog/website bears no responsibility for the accuracy, content, or any other matter related to any external site listed here or for that of subsequent links. Content © Gaurav Sharma 2009-2019. Awesome Inc. theme. Powered by Blogger.